Welcome to another edition of Wizzy News – probably the last for a while as the cricket season has drawn to a close. A number of items to report on this week including quite a few pics. 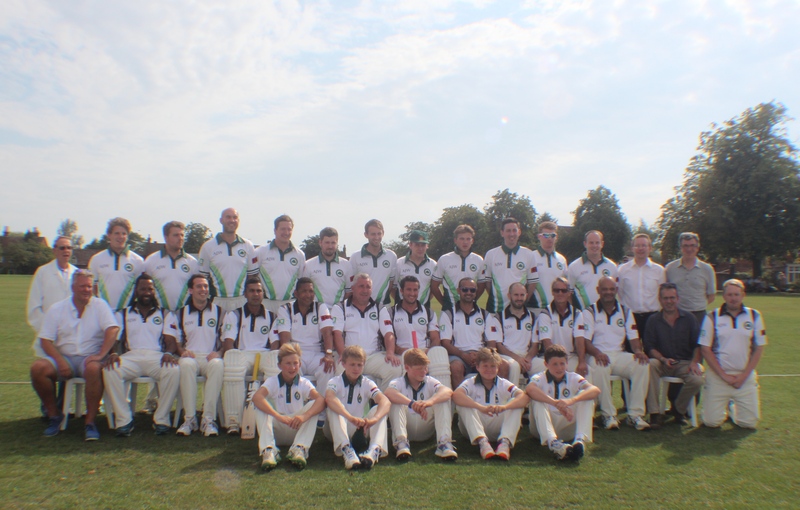 Legends and Wizzy served up a spectacle to celebrate 275 years of cricket in Wisborough Green – by Steve Calder Smith – Chairman of Wisborough Green Cricket Club. What a great day. It was really a shame if you missed it or didn’t get involved. The green at Wisborough looked at its best last Thursday as Phillip DeFreitas brought his Legends team to West Sussex. The iconic setting was enhanced by a marquee where 250 guests enjoyed the most relaxed of lunches with a Pimms tent and a wine bar to slake their thirst. The tables – carefully named after cricket positions – were beautifully decorated and a special thanks must be made to Sheila and Brian Goodchild for their floral arrangements which helped to create the perfect atmosphere. During lunch Roger Dakin had the audience crying with laughter as he compered the lunch brilliantly and told a string of totally outrageous stories and jokes. 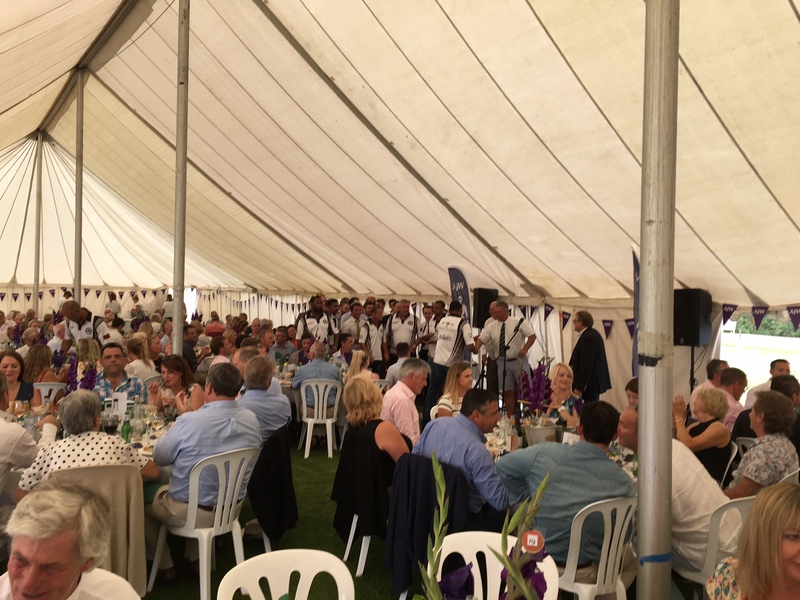 Maybe it was the wine, maybe it was his humour or maybe it was the singing of Robert Houston who was also a star performer, but the auction in the tent proved to be very successful. Lunch was incredibly relaxed , and a cooker malfunction affected neither the quality of the food nor the good humour in the tent. When the food was finally plated it was delicious and the Three Crowns Events Team should be proud of their efforts. During lunch, and as a fund raiser for Chestnut Tree House, the appearance of a camel added a certain whimsy to the day. 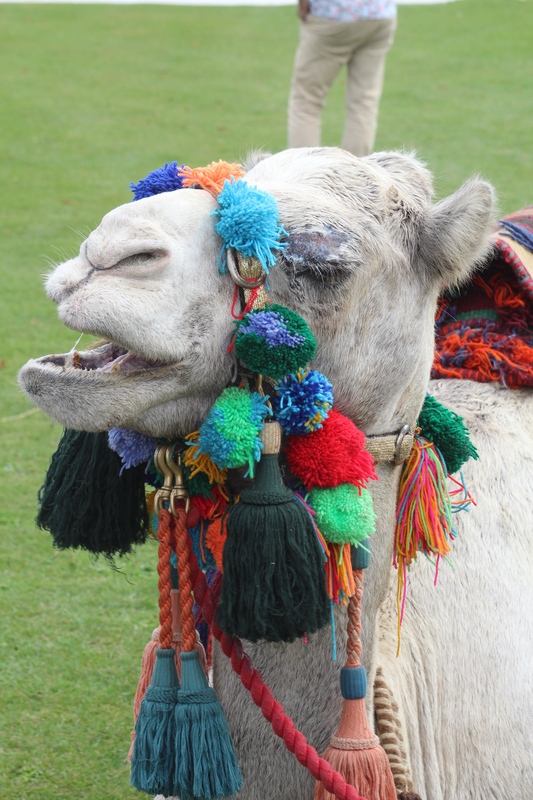 Selfies with the camel led to money being raised for this charity. It was great to see the interest it created and for one of my guests it was a real highlight. When the match finally started the Legends team batted, with strong performances from Owais Shah and Phillip DeFreitas taking them to a total of 187-5. A lucky score for Chris Francis who bagged the first prize in the guess the score competition of £250. Once again this competition raised significant funds, (thank you to all who supported it) as did the raffle whose first prize of a barrel of booze (although I am not sure it was needed!!) went to Tommy Howard. A couple of Wisborough Green colts starred with the ball and congratulations to both Tommy Colbran and Hughie Ragg for capturing the wickets. The latter being able to claim former England batsman, Owais Shah as a scalp. The crowds had spilt out of the marquee and others had arrived to swell the numbers as Wisborough Green pursued the score. Ultimately they fell 17 runs short of the target with Byron Napper scoring an impressive 65 not out. After such a day some decided to return home, but the Legends and many of the supporters sought refuge in the Cricketers where Craig and his team supplied more food and the essential lubrication. We were royally entertained by the man of many hats. I know when I staggered away as the clock tipped past 11.30 that I had had a great day. The e mails, texts and correspondence I received over the next few days assured me that the event was a real success. We are still not finalised in terms of accounts but hope to have raised more than £10,000 for the club junior development fund and Chestnut Tree House. It is impossible to thank all those involved on the day and during the set up, but special mention should go to our main sponsors AJW, who contributed not only a donation, but a considerable amount of time and effort into making this day a success. I would also like to pay a special and massive thank you to Rachel Sadler of Lifestyle Sussex for her unflappable, hardworking support for the event. Everything that happened on the day, apart from the cricket match itself, was organised and coordinated through her. If any of you need an event planner look no further. Finally, its days like these that help to put the cricket club on the map and show that even after 275 years of the sport in the village it can still be its heartbeat. Where would we be without the green and the sound of bat on willow. As another year passes, all of you who still would like to play the occasional game be you 15 or 65, fit or less fit, male or female, a novice or an experienced player, a batsman or a bowler; please make contact with me at Steve@is-health-group.co.uk . 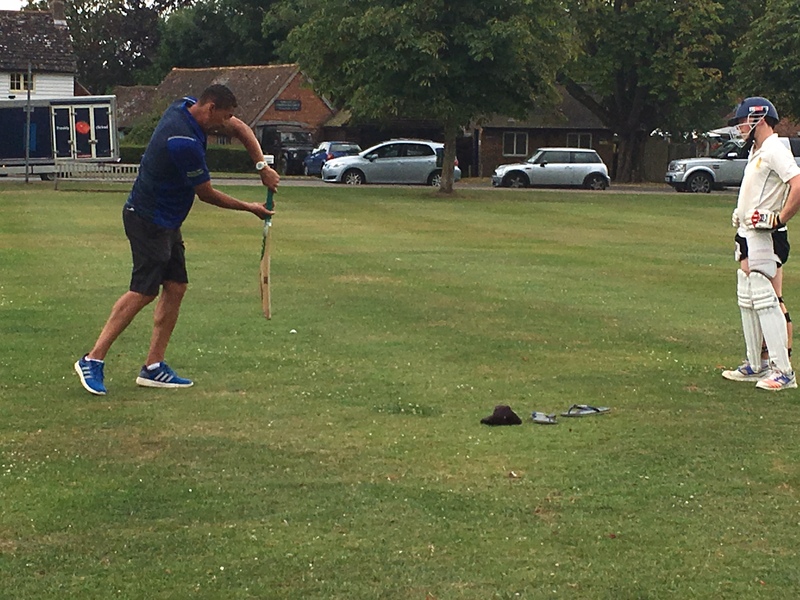 , we would love the club to be able to provide cricket for all comers, and if we know you are interested we can start to plan the fixture list for next year accordingly. A number of local newspapers have also included articles and pictures of the event. The sun was shining, the air was 30 degrees, and we travelled to 4th place Pulborough to try to secure promotion. The wicket did not look its best but we won the toss and elected to bat. Frank Vickery (29) and Steve Calder Smith (43) were the perfect partnership of stubborn defence and stroke play. 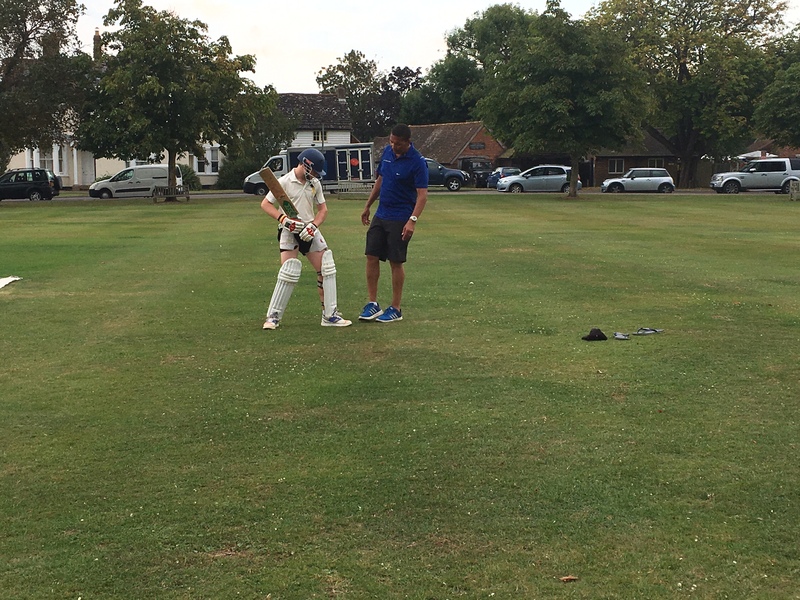 Steve set about the Pulborough attack with style and started to lead the partnership. Frank struggled but managed to find some rhythm eventually. Calder Smith went to a tame shot and was caught, but in came the effervescent Jonny Farmer (62) who for once managed to play as well as he talked. He smashed Pulborough to all parts and dominated the attack. Frank eventually went and followed quickly by Ricky Etheridge (11) and DJ (5), who usually put on a running between the wickets display, but in came Sadler. Farmer was still smashing the ball, and with a big outfield Sadler ran more 2’s and 3’s than was desirable. However the score continued to grow with 200 being the target. Farmer eventually went for 62, and in came Joey Calder Smith. Joey came and went, for 2, and Sadler was run out for 34, in the penultimate over going for a quickish single (Jim’s words..) . Tommy Colbran and Jack Sizzey Carter moved the score past 200, finishing on 201 for 8. 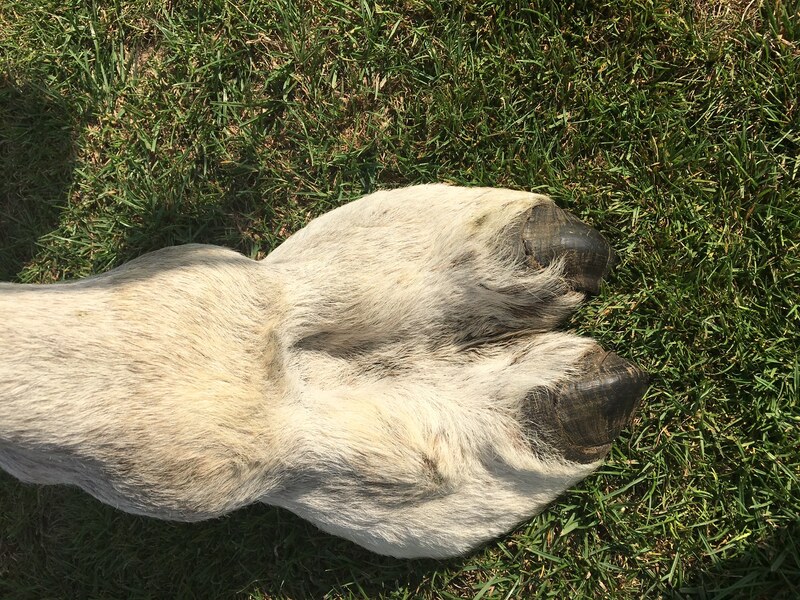 Pulborough looked a bit worn out after fielding in the hot sun. 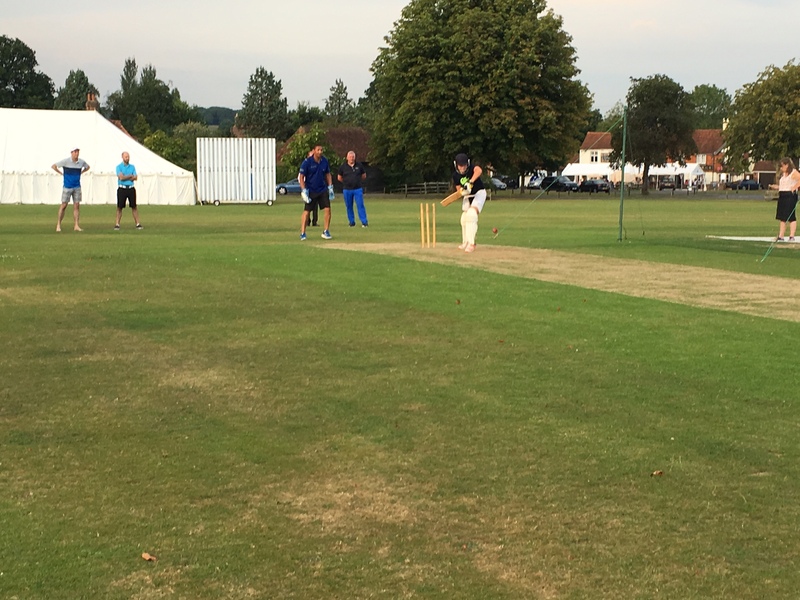 Hugo March and Joe Tucker proved to be a handful for the Pulborough Openers, taking the first 3 wickets in their opening spells. Hugo bowling a great spell of 6 overs 2 for 15. Tucker also bowled well, 9 overs 1 for 34. 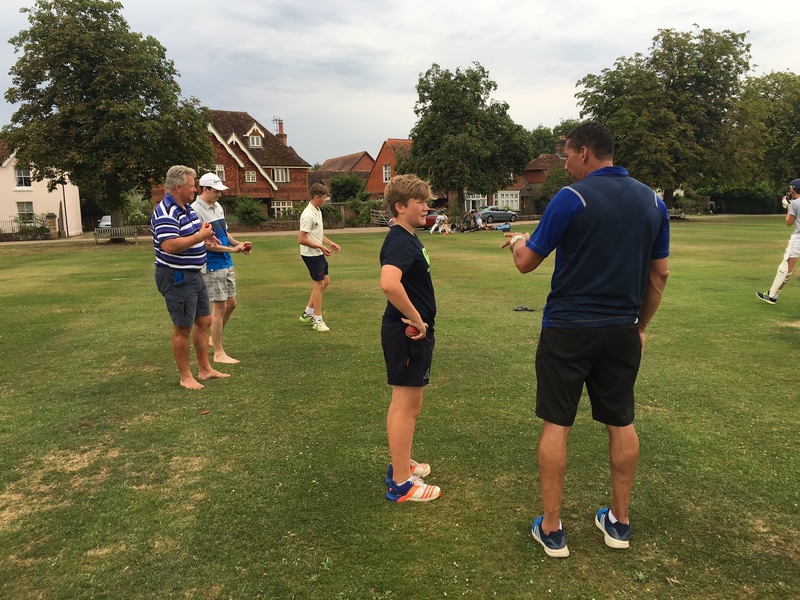 Jack ‘Fizzey’ Carter then replaced Hugo and after a rusty opening 3 overs started to find some form, and set about the Pulborough batsmen. Claiming 5 wickets for 32 runs. Jonny Farmer also bowled well picking up 2 wickets, but it was the flight and guile of Fizzey Carter that stole the show. Pulborough were out 91 in 28 overs. Wisborough gained 30 points which were not enough to win the league, but gain a credible 2nd place and gain promotion. I would like to congratulate the team on a great performance, whether you have played 1 match or 16, you have all contributed and added to what is a great season. Well done to all. Many thanks to Peter Klein for scoring and inputting the weekly scores, and any other scorers who have helped such as John Newman. 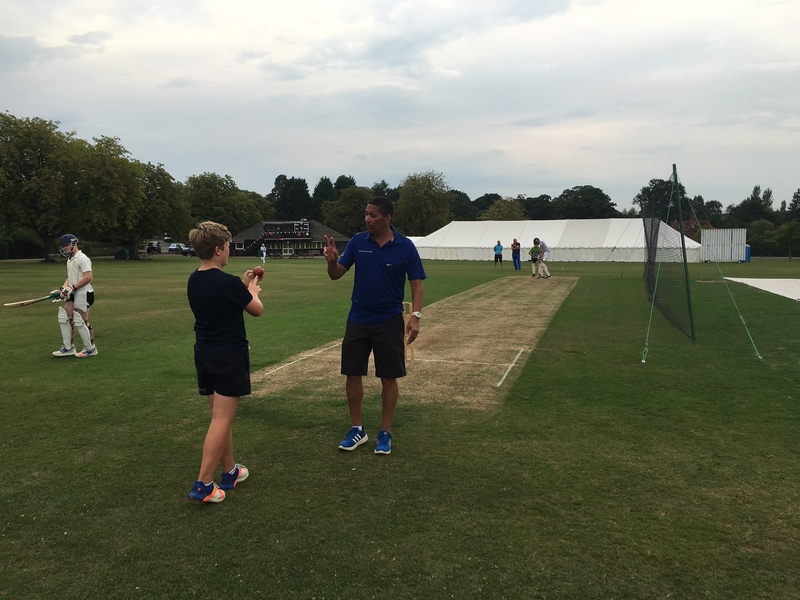 Many thanks to Peter Mattock for umpiring. 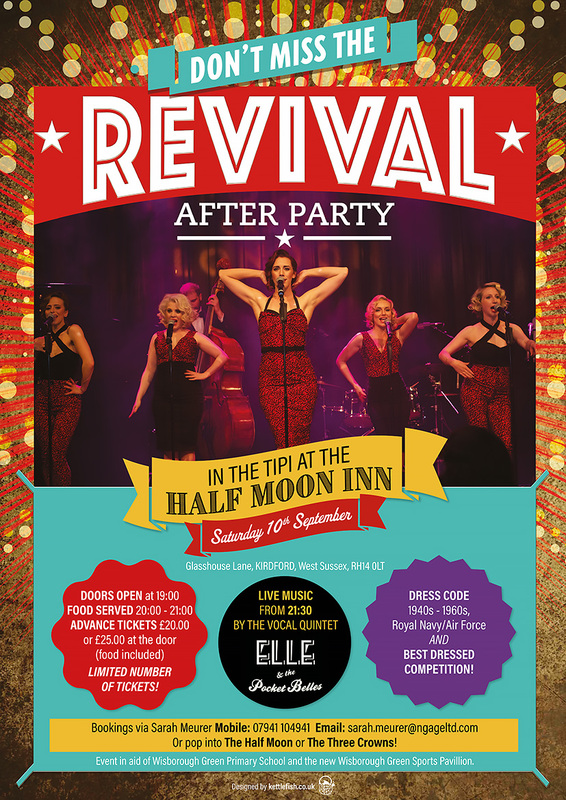 Please see details of the Revival After Party on Sat 10 Sept – a fundraising event for the New Pav and Wisborough Green Primary School. Sounds like a lot of fun and not to be missed. Thanks to everyone who contributed to Wizzy News – its been a great season.